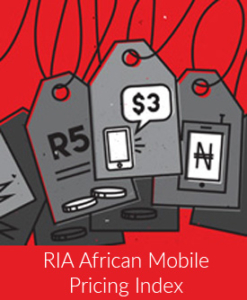 Research ICT Africa has developed a new mobile pricing portal with data on pre-paid mobile pricing products collected quaretly from all African operators in all African countries, since January 2011. The mobile pricing portal aims at increasing price trasparency in the African continent, in order to support users to make informed decisions when select a mobile operators and to compare prices across operators. It is also a useful instrument for mobile operators since they can compare prices at a country level and across countries. It helps at monitoring regulatory interventions and the effect of those – such as interconnection rates cut and new operators in national markets – on pricing. The portal is online at the following link.